In terms of overall performance there is little to seperate the two players. Both have been winning points at an exceptional rate (Djokovic 58.1%, Nadal 58.9%) and have spent a similar amount of time on court. 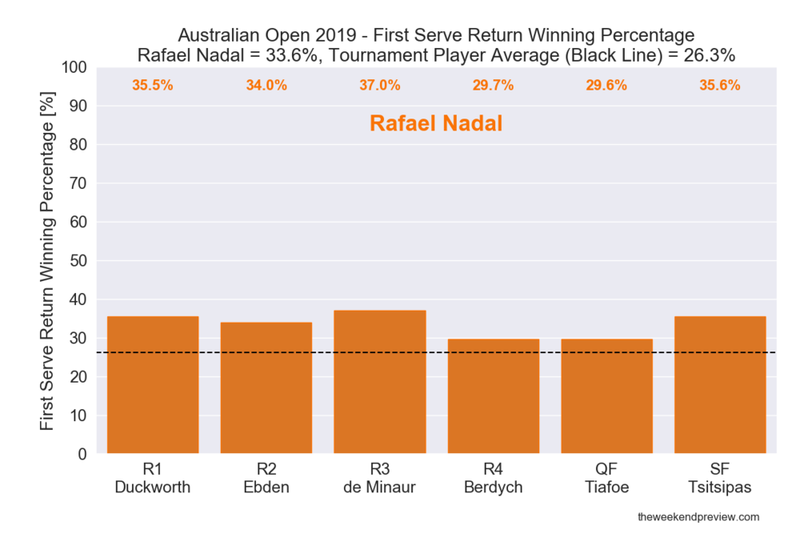 By comparison, the 2018 finalists had lower point winning percentages of 56.2% (Roger Federer) and 54.9% (Marin Cilic), underlining the dominance of Djokovic and Nadal in 2019. Both players have had near identical First Serve statistics. They are serving their first serve into play and winning the points on their first serve at above average rates (see Figures 1-4). The Aces strike rate is quite low for both players, but this is perhaps not surprising for players that are so dominant once a rally starts. It is in the Second Serve statistics that Djokovic has demonstrated the bigger edge, winning 69.4% of his second serve points to Nadal’s 58.0%. This is perhaps supported by Djokovic’s heavier second serve, measured at an average of 6.7 km/h faster than Nadal. Once again, both players have had near identical returning serve statistics. Both players have been exceptional, winning points on return of serve significantly above average rates (see Figures 7-10). The performance of both players on big points has been interesting. Both players have converted break points at a similar rate, however Djokovic has had the greater trouble in saving break points on his own serve. Djokovic has certainly had the more difficult opposition and that would undoubtably effect these statistics, but it will be intriguing to see how Djokovic handles the inevitable break points that will come on his serve against Nadal. 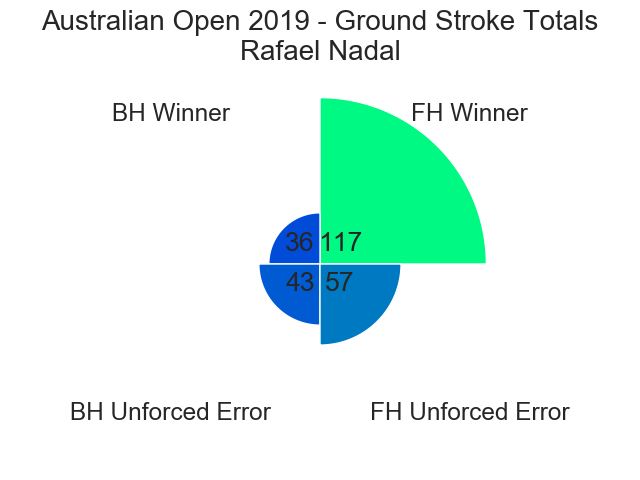 Both players have been extraordinary on their forehand this tournament, with the number of winners significantly surpassing the number of unforced errors. Significantly, the left-handed Nadal forehand matching up to the right-handed Djokovic backhand may just be where this match is won and lost. As exceptional as Djokovic can be on the defence, if Nadal’s forehand is once again ON tonight, I can’t see Djokovic withstanding it. Pre-tournament there was a concern on the fitness of Nadal. There has been no evidence to support this concern throughout the tournament, but he has yet to have been tested. If this match becomes a war of attrition, then I would expect Djokovic to have the edge physically. But if Nadal’s forehand can continually attack that Djokovic backhand, Nadal may be able to settle this match earlier.